If you think too as far back as your grade school classroom, you might recall being asked to research and profile an impactful person in history. How many remember being frustrated by the apparent lack of information on influential women? There are women in our past that have done extraordinary things. They were inventors, scholars, artists, leaders, pioneers, and warriors, but their stories seemed to have been nearly omitted from history and are instead overshadowed by their male counterparts. Unless a woman played the role of royalty or heretic, humanity has failed to write down her story. The stories not yet lost are the ones of exceptional women who have played a pinnacle role in our recent history; those who have shown strength, bravery, and sacrifice through wars and activism. Their stories are still prevalent and alive within the women who are still with us. All they need is someone to listen. Infinite Variety Productions is a New York City-based, a non-profit theater company whose main mission is to not only record these women’s stories but to bring them to life on stage. The company’s inspiration comes from personal documentation and interviews of the women being profiled. Through transcripts or diary entries, a script is crafted directly from the women’s own words and devised into a physically impactful, documentary theater piece. Past productions of Infinite Variety Productions (IVP) include Censored On Final Approach which tells the story of four Women Air Force Service Pilots (WASPs) who were hired by the United States Air Forces during WWII to fly military aircrafts, accumulating a combined six hundred miles and freeing male pilots for combat missions. It was not until 1977 that these women were finally given military status, over 30 years after the war had ended. For one of the runs of the show, IVP was able to perform in an actual WWII airplane hanger with five WASP’s in the audience hearing their stories. In the summer of 2018, IVP performed In Their Footsteps at the Edinburgh Fringe Festival. It is a culmination of interviews of five American women who had served in the Vietnam War. The script was made up entirely of the words of an army nurse, a WAC (Women's Army Corps), a Donut Dollie, a librarian, and special services coordinator. With the use of five wooden blocks and sound effects they made themselves, the cast depicted moments of the women’s experiences in Vietnam, including their day to day jobs, Christmas in a war zone, the Tet Offensive, and returning home to a divided nation. Three of the women were civilian employees and are not recognized military veterans. Because of this, they do not receive any veteran services. 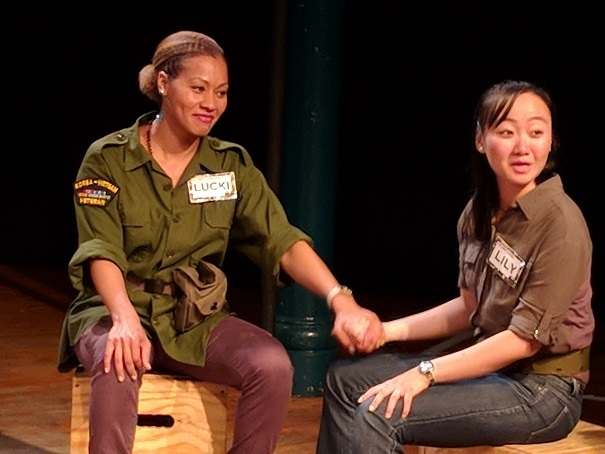 In continuing to perform the play, IVP hopes to shine a light on the dedicated service of those women and the fifty-nine civilian women who died in Vietnam but have not been memorialized. The company’s current piece is called Displeyst. It is the true story of a well-to-do Jewish family, headed by matriarch Margaret Welish. Fleeing Nazi persecution, Margaret took her family from Austria to the Philippines, only to have their lives ripped apart again by the invasion of Japan. IVP used Margaret's diary and interviews from her daughters to create a script showing that power and corruption can break apart an entire community, but love, family, and tradition can build a home anywhere. With fabric and wooden crates, IVP will illustrate the political tension that brought the Nazi party to Austria, the struggles and joys of starting a new life in a strange place, and the horror of being displaced yet again. IVP has a busy season ahead with Dyspleyst premiering at Under St. Marks in late April- early May of this year. The company is also focusing on its community outreach by developing a curriculum around creating documentary theater through one’s own stories that are geared towards both young people and adults. Also, IVP wants to give a platform to playwrights who have written plays about women in history with a public reading series launching this summer called Femtales. In partnership with the Women’s Overseas League, the company plans to travel to Texas and perform In Their Footsteps for the organization’s members in October. Also in the Fall, IVP is going to be doing an artist exchange with a female British theatre company they met in Edinburgh, The Blooming Buds. IVP will introduce The Blooming Buds to the theater world in New York City where they will perform their play Brenda’s Got a Baby, which is a documentary theater piece about the struggles of working-class women, in their own words. Likewise, the company will introduce IVP to the theater community in Bradford, England. It will be a meld of cultures, art, and stories, with the goal being a further understanding that telling the stories of those underrepresented matters. As a not-for-profit theater company, the work IVP can bring forward is mainly possible by the generous donations of theater donors and patrons. To raise money for the upcoming season the company is having a swing dance party on February 15th. Guests can come dressed in the style of swing lovers of the 1930s, get their makeup done, and have their photo taken to commemorate the night by a professional photographer. The night will continue with a swing dance lesson by an accomplished teacher, a free form dance party and raffle with refreshments. Tickets for the event are on Infinite Variety Production’s website. If you are as passionate of bringing the stories and accomplishments of incredible women to the forefront, and you want to help the company carry out their mission, there is a donation page on the website as well. All donations are tax deductible. All the money they raise will go to helping IVP’s goals for the season become a reality, and to ensure that their company’s mission is upheld. IVP’s namesake is inspired by Antony’s quote from Antony and Cleopatra by William Shakespeare, “age cannot wither her, nor custom stale her infinite variety,” The company believes all women are made of infinite varieties and deserve to be celebrated and revered. Niki Hatzidis is an actor and award nominated playwright based in New York City. She is a writer and producer on the newly launched The Beautiful Work Challenge podcast by catalysta. NikiHatzidis.com.